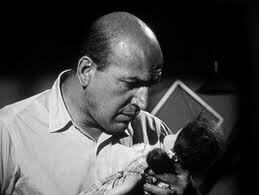 Telly Savalas (Kojack, Beyond The Poseidon Adventure) plays Erich Streator, a boorish and insecure jerk, in this incredibly scary and chilling Twilight Zone Episode from Season 5 called “Living Doll” This episode was written with style and mood by TZ mainstay Charles Beaumont (Masque of the Red Death, The Haunted Palace) and co-written by Serling and Jerry Sohl (Die Monster Die), who goes un-credited. Streator is immediately set up in his household as a sort of down on his luck paranoid guy who is newly remarried and has the subtlety of a brick through a pane glass window. He’s surly, paranoid and very angry. 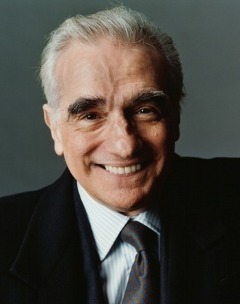 He also has to learn to accept his new step daughter Christie, played by Tracy Stratford. 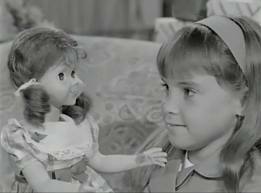 At the episode’s onset Christie’s mother and Erich’s wife, Annabelle (Mary LaRoche) comes home with her daughter and a new companion for her. 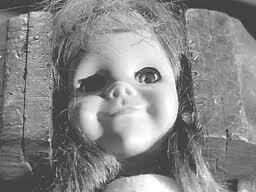 An unassuming large doll named Talky Tina. She seems to adore it immediately but Annabelle tries to get her to rush up to her room with Tina before Erich can get a look at her. It doesn’t work and Erich is quickly annoyed by the fact that Tina has been bought for Christie. Beaumont sets him up as a jealous louse who apparently doesn’t like his step daughter getting more attention than him. Annabelle tries to let him know that they were able to afford the doll despite Erich’s protests. She feels ok with the purchase but Erich is bent on being aggressive and unkind about the whole thing. 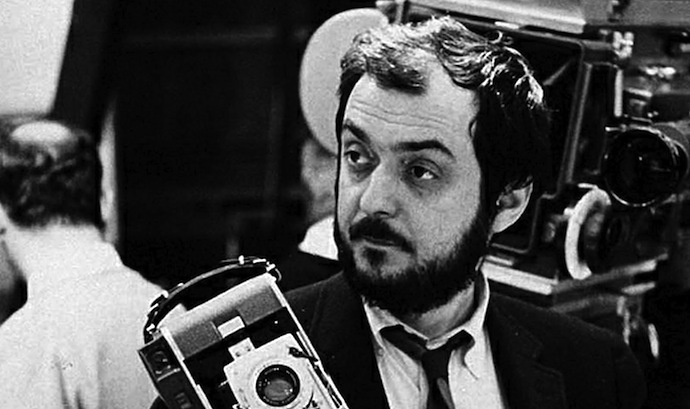 He certainly has other deeper issues that make him a frustrated individual. Sarafian deftly explores the issues, grounding the material in drama. It isn’t until Erich gets some one on one time with Talky Tina that Beaumont opens the floodgates. Erich discovers that Tina has “Quite the vocabulary” after she claims very creepily that she doesn’t like him and that he better be good to her. Erich, tries to be understanding and accepting of Christie and Tina after his outbursts of anger (he even throws her across a room) but it is too little too late as far as the supernatural “Living Doll” is concerned. For many fans of TZ this episode is a hands down favorite. It has a villain (Erich), a victim (Christie) and a neutral character in the form of Annabelle who cannot understand why Erich is hell bent on ruining Christie’s life by attacking her doll. He even blames Annabelle at one point of being behind Talky Tina’s strange and disturbing vocabulary. Erich reaches that edge though and then leaps right into classic TZ territory. He tries desperately to destroy, hide and get rid of the doll to no avail. She won’t burn. She can’t get cut (he tries with a buzz saw in one of the creepiest scenes in the episode) and she appears out of now where through out the house. Sarafian, Serling and Beaumont give us a great, tight and efficient thriller here about yet another strange doll. 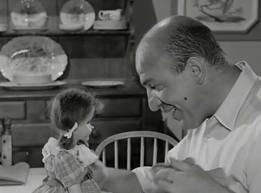 It’s important to note that there is a consistent “Doll” theme and arc that runs through many episodes of TZ. This episode though requires no such flights of “in your face” metaphor and subtext like say the episode with Cliff Robertson and his talking dummy. The episode builds up to a boiling point and it even gets a resolution but in the Twilight Zone not all things are fair in love and war. Christie gets Talky Tina back but Tina has a long memory and has become in turn the villain of the piece by the end which is both frightening and unexpected. “Living Doll” is a creepfest with great performances, an efficient script that is chilling and has a very polished look with great camera work and suspenseful music. I dare you to look away or not finish this one once you have started it. It may make you think twice before buying a doll that talks and becomes a vengeful protector. I love this episode. Haven’t seen it in years though. But this was always a favorite of mine. Great job Vic. Thanks! I may watch this one tonight lol. I loved this episode a whole damn lot when I first saw it. 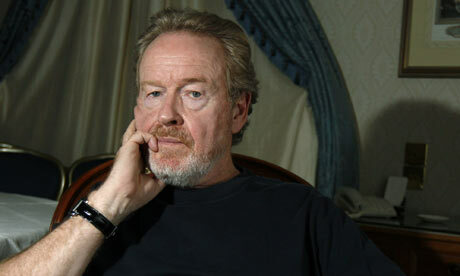 It’s easy to see where a movie like Childs Play drew its inspiration from. On top of that its great to see it highlighted in the current day and age by you in a very nice review. Im going to rewatch this soon, thanks Vic!